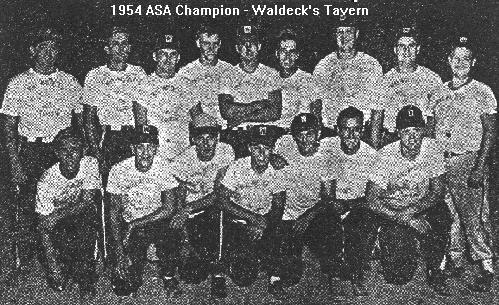 Waldeck’s Tavern won 6 straight games to capture the title, outscoring their opponents 82-36 along the way. 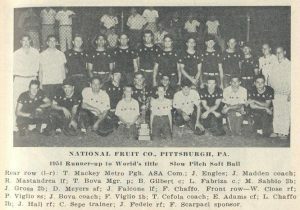 They defeated Peerless Woolens of Georgia 32-7 in the winners bracket final behind the hitting of Jerry Huber, Fred Heimkreiter and John Drees, all of which had five hits. Drees getting a couple homers. Waldecks collected 38 hits in the contest. 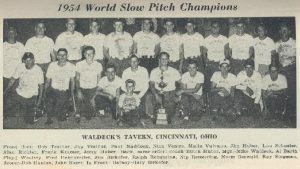 Waldeck’s then sat back and waited as last years runner-up, Pittsburgh National Fruit eliminated defending champs, Shields Contractors 5-4 and then disposed of Peerless Woolens 15-11 in the losers bracket final to get back to the finals. 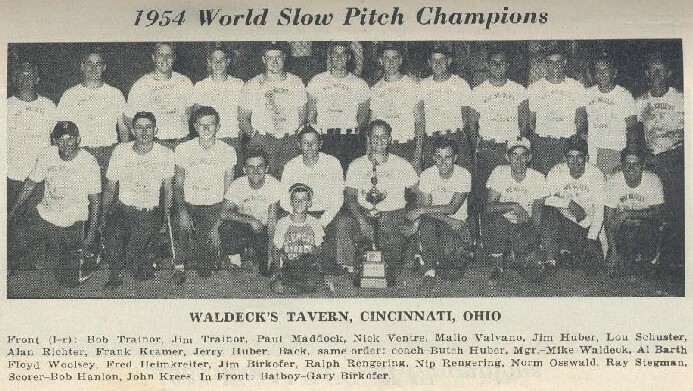 Waldeck’s Tavern proved to be too strong as it won final 13-7 hitting 8 HRs. John Drees went 4 for 4 and hit 4 straight homers while Frank Hiemkrieter, Jim Trainor, Bob Trainor, and Frank Kramer each had 1 to back the pitching of Malio Valvano (Valvano surrendered only 31 runs in 6 games for Waldeck). Drees ended the tournament getting 9 straight hits, including 6 HRs. Pittsburgh pitcher Tony Bova had 2 home runs in a losing cause for the Fruit Merchants. Mike Sabbio and Bruce Gilbert also hit HR for Pittsburgh. James Caldwell of Shields went 13-18 to lead the tournament in hitting. Ralph Bo Stuntebeck, delayed due to work commitments, only played the last two games for Shields, yet still made the All Tournament team as he went 6-9 with 3 HRs and 2 doubles. Donnie Key of the Louisville Stars started the tournament with 8 straight hits, before going 2-4 with 2 HRs in the third game.